Taiwanese computer peripheral and hardware manufacturer Asus has launched the Eee Pad Transformer, at a press event in London where it’s set to be the world’s first Android ‘Honeycomb’ 3.0 tablet device to go on sale. Asus Eee Pad Transformer is a 10.1-inch 1280×800 touch screen device, which is powered by the Nvidia Tegra 2 1Ghz dual-core processor, with 16GB or 32GB of internal storage and a 1.2 MP front-facing and rear-facing 5 megapixel camera. The Eee Pad arrives with just WIFI for internet access, with a 3G+WIFI version tipping up in June. 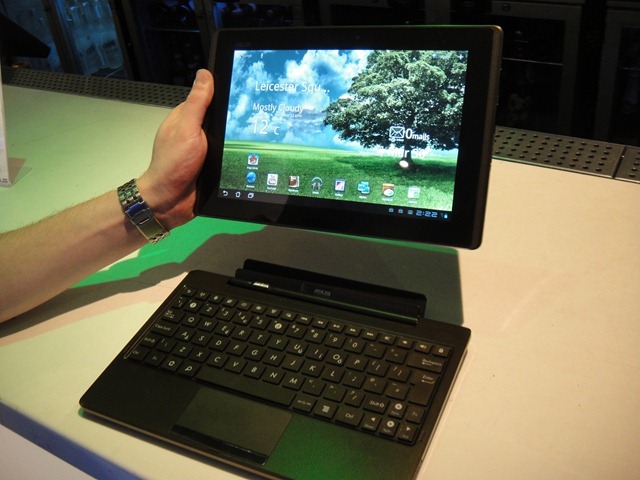 Asus’ Eee Pad has a keyboard docking station available that turns the tablet into a laptop, giving the device the moniker of ‘transformer’. The 16GB variant is priced at £379, where the keyboard docking station iteration costs £429 – the same cost as the 32GB model, both of which arrives with unlimited on-line web storage. The World’s first Android Honeycomb driven tablet, in the Eee Pad, is now available to pre-order from PC World, Currys, Comet and Carphone Warehouse with a delivery date of April 6th. One Mobile Ring attended the launch of the Asus Eee Pad Transformer; stay tuned for a hands-on walk-through of the tablet in pictures, on video and a first impressions review.